Bake me a picture: Cute and Fuzzy... or rather, Cute and Fudgy! Cute and Fuzzy... or rather, Cute and Fudgy! A cute little fuzzy fudge covered bear, with white chocolate fudge and as much chocolate as I could possibly get in there! I carved him out of several stacked circular cakes, and used one tray baked sponge for the laptop, table and the bears legs. 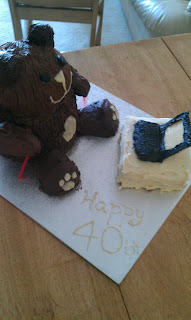 The arms were foam covered with fudge icing to make sure they werent too heavy and didnt fall off. Overall I think he is quite cute! There are still some things I would like to improve! Such as the head to body ratio, but all in all a fair effort I think. 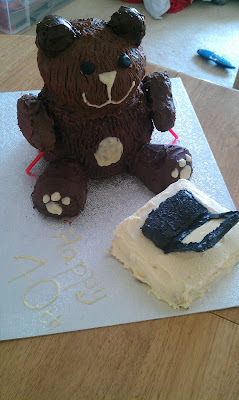 And at least all recipients of the cake raved about it, so if nothing else it tasted good! Please feel free to post any comments or questions! Or any interesting themes that you would like to see in cake form. I am always after new ideas!